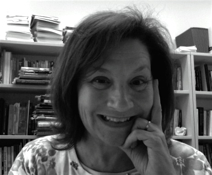 Rachel I. Mayberry is a professor in the Department of Linguistics at UCSD. She uses sign language and deafness as a means to model the critical period for language from both psycholinguistic and neurolinguistic perspectives. She received the Ph.D. from McGill University, the M.Sc. from Washington University, and the B.A. degree from Drake University. Prior to joining UCSD, she was on the faculty at McGill University before that a research scientist at The University of Chicago.